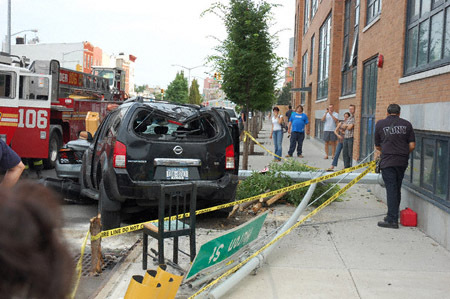 Well, Greenpoint drivers continue their reign of terror. I’m writing to report a traffic crash at McGuinness Blvd and Huron Street at around 6:15PM. A driver, evidently speeding at what must have been way over the speed limit (50 mph? 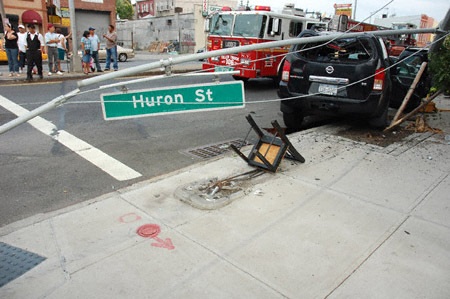 ), hit a lightpole (knocking it clean off the sidewalk) and a parked car on the southwest corner. The driver appeared unharmed but shaken. Of course he was not ticketed or arrested. 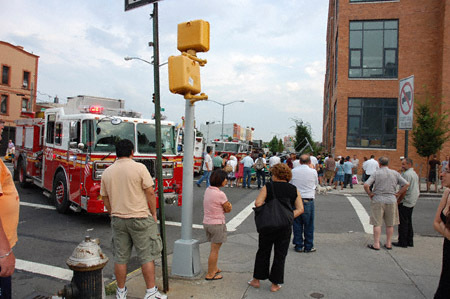 Witnesses report that the driver almost hit several people on the sidewalk and in the crosswalk. One witness said that the driver was swerving to avoid another car, which fled the scene. 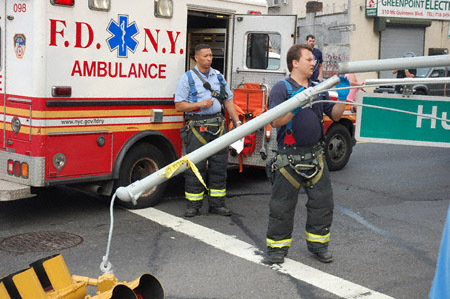 FDNY blocked off the intersection, but NYPD did not direct traffic. This encouraged stupid drivers to drive over the sidewalk to get down Huron. 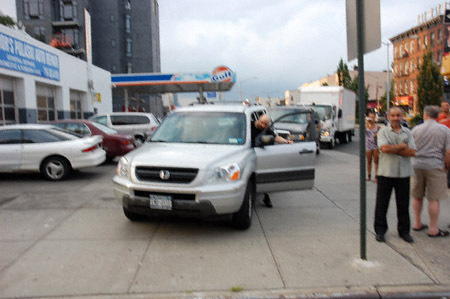 One driver got confrontational and threatened to assault pedestrians when they were “in their way” on the sidewalk. 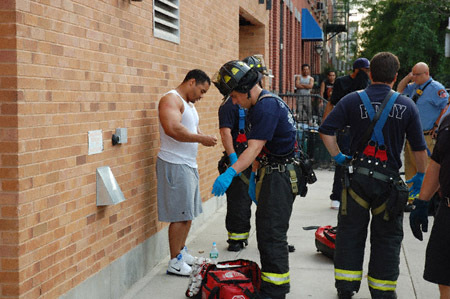 Looks like Lofts 305 got an unexpected visitor. Apparently this is the motorist that was threatening pedestrians. An officer heads over to talk to the driver. You know what would be nice? If they enforced speed limits on McGuinness. Almost every time I drive down the Blvd, I’m passed by at least one vehicle traveling around 50mph. And don’t get me started on the Pulaski. That thing’s a regular raceway, for both cars and bicycles. And get off my lawn while you’re at it! God forbid the 94 officers do their job. Oh wait, they don’t help the local citizenry, they harass them. In this case, it was a passive harassment. Goddamn, they are inventive. 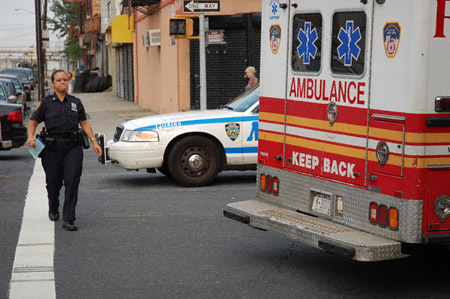 There are actually cops at the foot of the Pulaski in Greenpoint fairly often. But I think you have to be going pretty fast to get pulled over (as someone who hasn’t gotten a ticket going 40ish on the way down the bridge…). They’ve gotten trickier lately too – backing down Freeman St so that they can just barely see out with their radar gun. That being said, people still go waaaaay to fast along McGuinness. I’d also like to add, for AMOJA’s sake, that once upon a time, I was in a car that got a speeding ticket on McGuinness while coming off the bridge. Back in 1998. I haven’t seen a cop set up there in years. I don’t know if it’s been reported anywhere else but evidently a pedestrian was hit on McGuiness near the corner of Green this past Saturday night by an Ice Cream Truck coming off the bridge – presumably headed back to the garage on Green between Provost and McGuiness. A person I talked to at the scene did not know if the pedestrian had survived. . . I haven’t heard anything but I’d be hardly surprised. One of those ice cream trucks jumped the curb on Huron Street at McGuinness (where a gas station is located) and damned near hit me in the process. The audacity— of me thinking I could walk on the sidewalk. I come home over the Pulaski frequently at night and often see a police car sitting there waiting with its radar gun. That said, speed traps do NOT equal good policing. Good policing is being out there, patrolling, setting the pace, looking for erratic drivers.